Weekends are usually busy family days, not often spent on my ‘projects’. Saturday I managed to sneak-in a few hours of mindless felting… with no particular ‘project’ in mind. 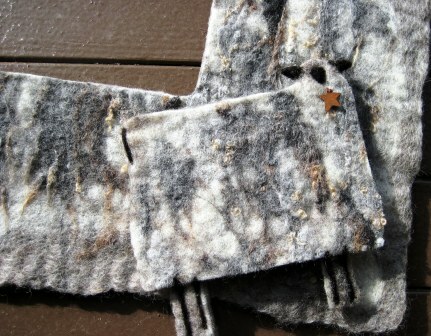 This is what I ended up with: four pieces of nicely ‘textured’ felt. I arranged several layers of felt to my desired thickness, and then incorporated contrasting ‘raw’ wool staples on the top/final layer. …and this is what I ended up with today. 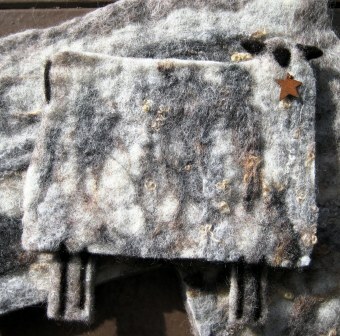 A no-sew primitive sheep. Perhaps he can be used as a mug rug? A simple table decor? A sheepie ornie to decorate my Easter tree? Or, perhaps I’ll string a whole flock together for a ‘ewe-nique’ garland of sheepies running across my mantle. 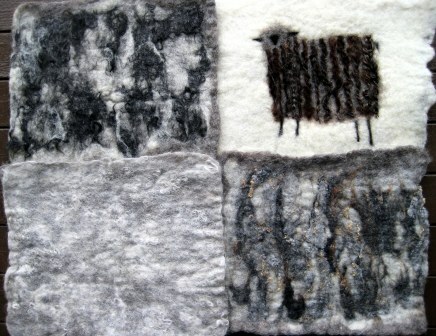 This entry was posted in Projects, Sheep/Fiber and tagged felt, felting, fiber art, natural, Sheep/Fiber, sheepy, Shetlands, wet felting, whimsy, wool by Sheepy Hollow Farm. Bookmark the permalink.